Just a 15-minute walk from the train station this beautiful building provides a stunning home for businesses. These state-of-the-art offices are fully equipped, with reception services and telephone answering to help your operations run as efficiently as possible. It's not just all about work at this location- with an on-site gym and fitness room and a variety of breakout areas, you'll feel comfortable and motivated at all times. Close by, there are plenty of hotels and restaurants, as well as an events venue for conferences and conventions. This brilliant industrial park offers a great range of industrial units, with additional office space. The location currently has a total of 17,577 square metres of industrial space, with each unit starting from 1,815 with an added 283 square metres of office space. You can also choose standalone office space, customisable to your needs and business requirements. The location offers secure on-site parking and loading docks, suitable for cars, trucks and trailers. This workspace solution is perfect for businesses that want to flourish under the best, most adaptable conditions. With a superb location in the south west of Maastricht, travelling to and from the space is quick and simple. This business centre offers reliable facilities, flexible solutions and good accessibility. An extensive package of services is available to suit a range of business types and sizes. This Maastricht office centre provides an inspiring entrepreneurial environment in the heart of the Randwyck-Noord business park. This centre is easy to reach and offers a range of workspaces to suit your business needs. There is also an events venue where you can host conferences just 5 minutes away by foot. Here, you can benefit from an inspiring atmosphere, videoconferencing facilities, onsite parking and administrative support. The space is accessible 24/7, with all-inclusive rates, as well as an onsite restaurant, bar, gym, meeting rooms & classrooms. The centre is surrounded by lots of local cafes and eateries so you can spend your lunches at a quiet, relaxing area. This centre is impressive, and offers co-working spaces designed to accommodate start-ups and creatives. It has a peaceful and motivating working atmosphere. Located within a brand new building in one of the most prestigious areas of Maastricht, these office spaces offer a highly professional environment, ideal to run a successful business. Within walking distance of the railway station and the city centre, the building benefits from a strategic location and is surrounded by companies, restaurants, shops and numerous amenities. Just a short stroll away, there is an abundance of museums and art galleries. This new building is part of 'Parc Ceramique', a lively new suburb known to be spacious and green and within walking distance from the beautiful city centre of Maastricht. The offices are furnished and serviced according to company needs with parking spaces underneath the building. 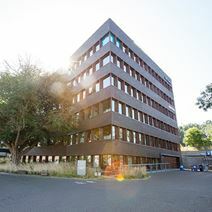 The centre is situated close to the A2 motorway and Maastricht's central station, furthermore the Maastricht Aachen Airport which is just 13 kilometres away.